Bellwether Software Corporationasing Module is designed to provide complete vendor and material file management capabilities and can be used as a standalone unit or with the system's other modules as part of a fully integrated system. With this system, users can create purchase orders from requisitions, requests for quotations, and previous purchase orders. When none of these sources is available, users create a purchase order by specifying the vendor they want to buy from and the materials they want to purchase. Users can also specify the desired vendor by entering the vendor number. The system can draw the standard information from its vendor file and enter it automatically. The system can also enter the tax percent, ship-to code, bill-to code, buyer name, payment and terms, and the prepaid freight option. Users can override any standard ordering information with their own data and may include information that includes the delivery date, job number, project number, and G/L account codes in the P.O. header to apply to the order as a whole, or individually for each P.O. line item. 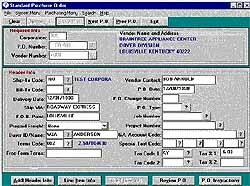 In addition, users can items to purchase by entering either a literal description of the item, or by using the item number to draw standard ordering information from the system's material file. Up to 999 items can be entered on a single P.O. As users enter each line item, the system automatically extends its price and calculates the tax amount on all taxable items. , 9900 Shelbyville Road, Suite 6B, Louisville, KY 40223, Tel: 502-426-5463. Fax: 502-423-8963.